Regrooving of tires is not a new concept. It has been in practice for ages now, but sensible people or tire dealers do not recommend regrooving consumer tires. However, the process is perfectly normal and recommended for commercial tires if done with proper equipment and machinery. For those who do not know, regrooving is the process in which the tread pattern is reproduced on a tire by cutting into the tread according to manufacturer’s tread pattern. 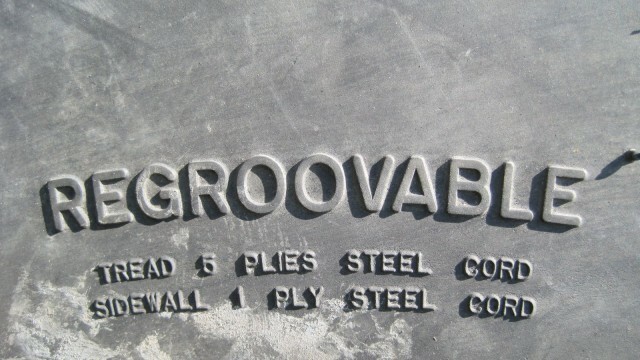 The regroovable tires have the required amount of under tread rubber for this purpose and are marked as ‘regroovable’. 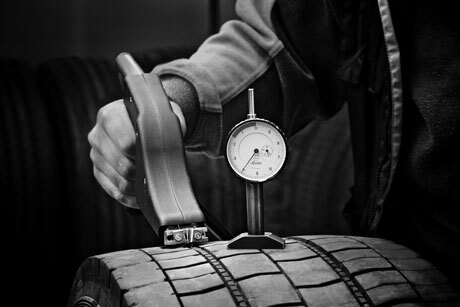 Professional tire regrooving is a workable option that prolongs the life of a tire making it even more economical. If done in a proper manner, regrooving can be beneficial in two ways; firstly you can have the same tires on for longer periods and secondly the lower profile thickness reduces rolling resistance resulting in improved fuel economy. It also helps the environment, but people do not go for regrooving for that reason. The tires that have regroovable marked on their side have the ability to cut tread grooves deeper into the tire to give about 50% more tread. This is done without hurting the reliability of the tire because of an extra thickness of rubber that has been built into the tire at the time of manufacturing. Regrooving is said to be done on tires that are not supposed to get the vehicle on the road like farm vehicles which run on barren lands, etc. You may have heard that people get their passenger car tires regrooved without knowing that these tires are not designed to be regrooved and what are the consequences or regrooving non-regroovable tires. The regroovable tires are specially designed. The tire carcass and the tread are molded together from separate parts. The tread is designed to be cut, with time when the tread layer no longer remains thick enough to be regrooved, after regrooving several times, it is stripped from the carcass and a new tread layer is molded onto the carcass. Why it should not be done or cannot be done on car tires is because the rubber tends to be divided into two zones, with the outer rubber being softer and stickier that grabs the road well and the rubber you get after all the tread is worn off which is rock solid. In many countries including Pakistan, there are no regulations when it comes to tires but in the West it is highly emphasized. In the US, the Federal Government has explicitly created specific regulations to regulate the regrooving of truck tires. The government is aware of the dangers of improper tire regrooving. Under a particular section dedicated to regrooving of tires, it is said that individuals may not offer or sell regrooved tires by “removing rubber from the surface of a worn tire tread to generate a new tread pattern.” In simple words, it means that a person may not shave off or decrease the amount of rubber on a truck tire. Regulation also states that truck drivers are required to maintain tires that have a protective covering of tread material that is at least 3/32 inch thick. If there are any groove cracks or evidence of tread separation, a truck driver may not use the regrooved tires. In the USA National Highway Traffic Safety Administrator states that truck drivers can face a fine of $1000 on violation of rules of regrooved tires. Some truck drivers try to regroove tires themselves without using proper equipment and procedures. They do not realize how lethal it can be if you do it yourself without having proper knowledge about it. It is impossible to regroove tires accurately yourself without tools and knowledge. A truck with poor regrooved tires is at a greater risk of losing control and spinning of the road. Major accidents take place due to this and one of them was noticed couple of months back when a school bus driver could not have proper control over the bus and smashed into other cars just because of using so-called regrooved tires. After investigation, it was safely concluded that the tires of the bus were not properly regrooved. Regrooving is a debatable topic and many of us out there agree that it should be done with proper equipment’s and many of us are against regrooving. It is a very serious topic and that is the reason I have dedicated my time talking and informing you guys about it. As we do not have proper regulations and rules of regrooving tires here in Pakistan, we the car drivers must ensure that we do not get fooled by the dealers at time of purchasing tires as better tire means better grip and better safety.